It’s impossible to not instantly fall in love with . She’s charming and incredibly down-to-earth and has an open-arms attitude that immediately draws you in. A wellness guru, Jules has made it her mission to empower women to embrace mindfulness and invest in their well-being while having fun and enjoying every changing moment. She does so through her popular blog, , where you’ll find inspiring ideas and stories every week that run the gamut of self-care tips, mind-body-soul advice, and tasty gluten-free recipes. 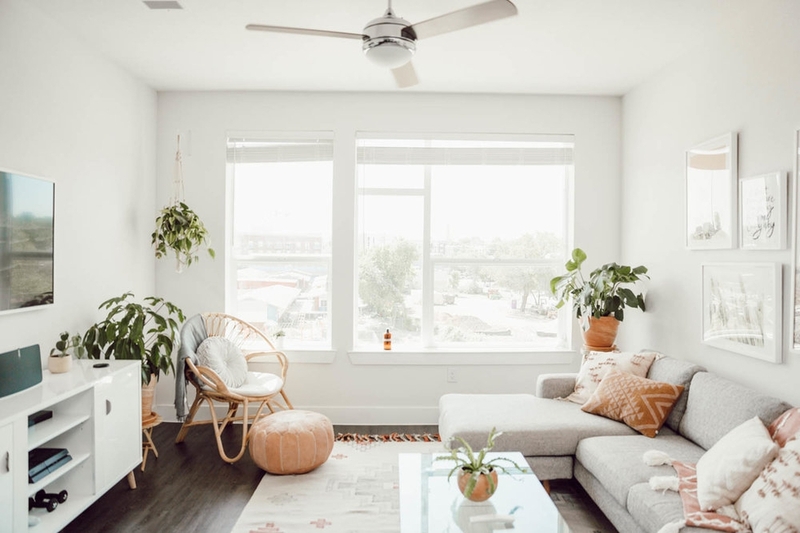 And having purged nearly everything from their Brooklyn apartment before moving across the country into their new home, Jules’s empty living room provided the ideal blank canvas for a boho-Zen space. Read on to find out how the design, which includes a workspace, came together step by step. 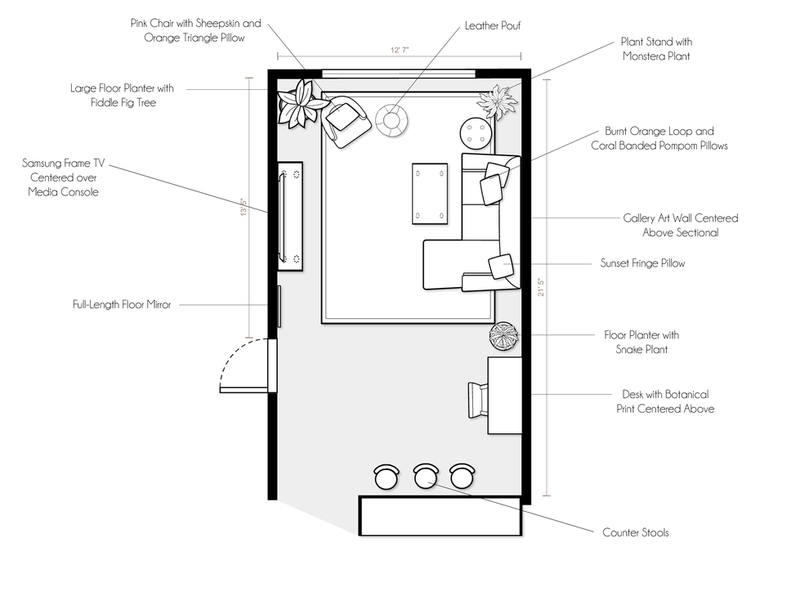 In addition to those being top priorities, Jules also relayed to Erika that the living space needed to not only be comfortable and inviting enough for game nights, but it also had to accommodate a work area. 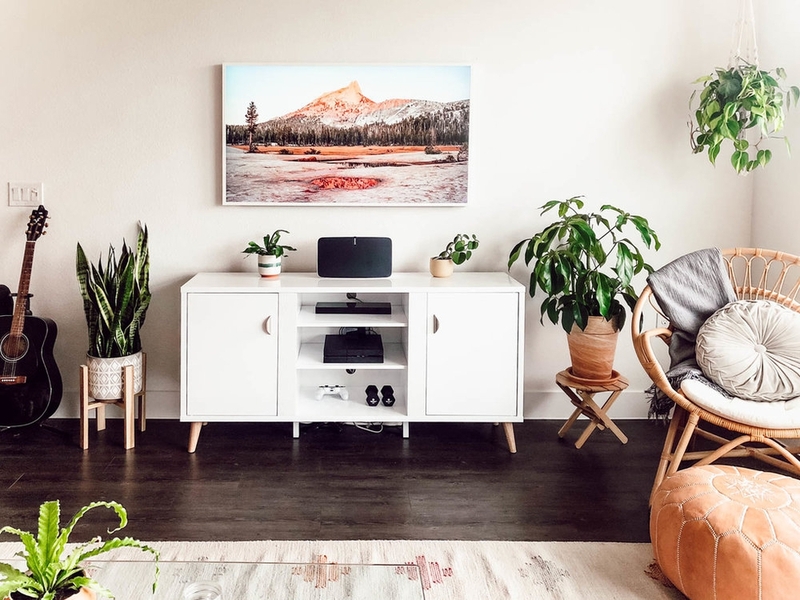 “We wanted to make sure the living room space could also contain my office,” says Jules, who wanted her office to feel like its own separate space within the room. 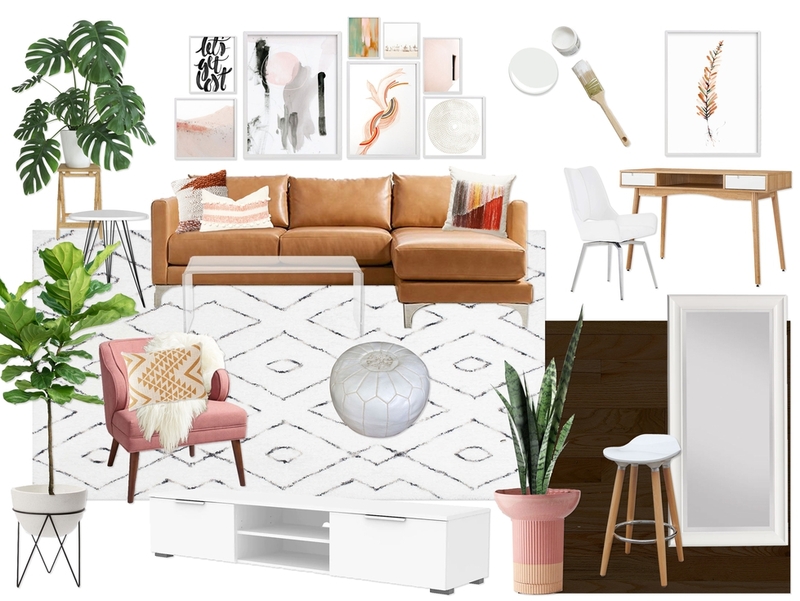 Given the need to land on a layout and the main furniture pieces as soon as possible, Erika quickly devised two concept boards that included furnishings, fun textures, and colorful touches that spoke to Jules’s simple, boho style as well as floor plans that met all her practical needs. For Concept 1, Erika was inspired by Jules’s love of “fresh greens, soothing soft grays, natural tans, and a backdrop of clean, bright white.” It puts emphasis on soft, natural hues and textures, such as walnut and light wood tones paired with sleek white surfaces, to strike that balance between humble and sophisticated. With Concept 2, Erika focused on a more vibrant palette of “gorgeous blush, burnt orange, warm tan, and lush green tones,” which embody the rich hues of a soft desert sunset—a palette drawn from inspiration images Jules had shared. She then worked in comfortable seating, such as a perfect-size sectional, an extra leather pouf, a desk chair, and barstools at the kitchen counter. 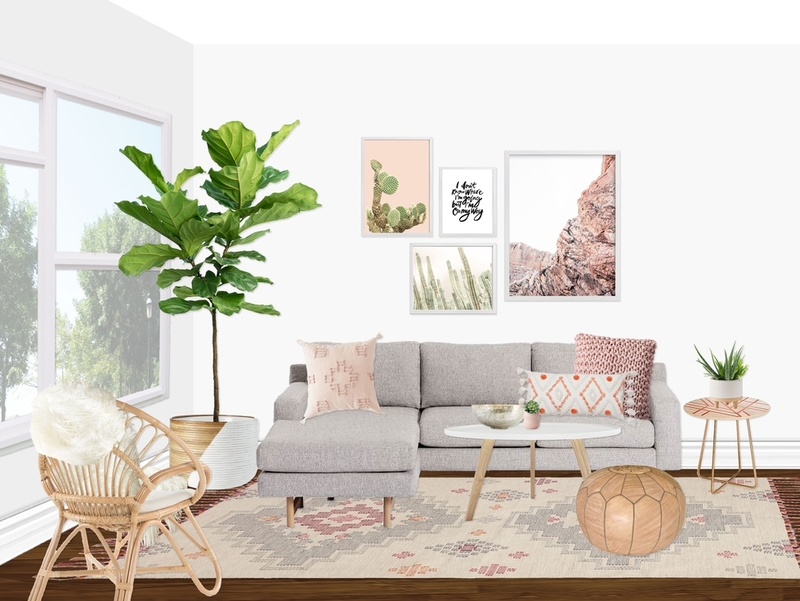 To give the room the clean, boho vibe that Jules loves, Erika incorporated colorful textured pillows, a soft sheepskin throw, funky planters, a black-and-white shag rug, and eclectic art for the wall. 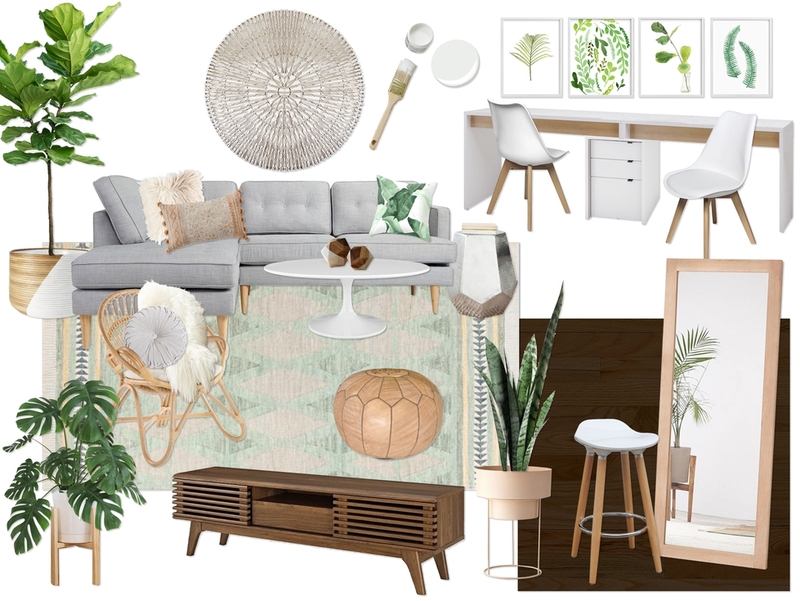 After seeing the two concepts, Erika and Jules reviewed the layout and specific furnishings from both boards for each of the three main areas in the living room: the seating area, the TV wall, and the workspace. “We put our heads together to come up with the best way to work all of Jules’s favorite things into the final design,” says Erika. To start, they vetted each major piece in the concepts together in detail, starting with the sectional to the TV console to the desk. “Where we played with things a little in the layouts was exploring the idea of a single versus a double desk. Ultimately Jules opted for the cleaner, more spacious option of a single desk and a bookshelf. But the layouts were otherwise consistent between each concept as planned out with Jules,” says Erika. And with the key pieces selected, all the little, colorful accents and textures came together seamlessly for a stunning final design that’s perfectly Jules. 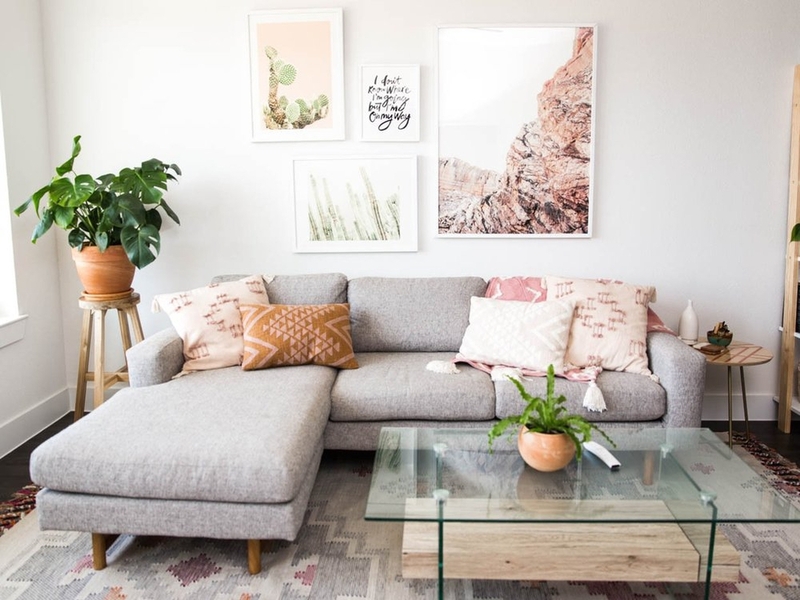 The light gray sectional is the main staple of the living room, which comfortably seats four, is topped with a blanket and throw pillows from Urban Outfitters in warm hues. The soothing palette of blush and hushed orange tones extend to the gallery wall of photographs, small planters throughout, and the flatweave rug ties together all the furnishings and accents. To play up the airy, uncluttered atmosphere, Jules ultimately opted for a glass-and-wood coffee table from Target and visually minimalist details, such as slender white picture frames. “I personally was obsessed with the incredible rattan chair, and knew Jules would be too,” says Erika. “And I was right—it was one of the first things she bought!” To provide additional seating that didn’t take up too much space, they also brought in a tan leather pouf. Another finishing touch that brought the room to life? Lots of lush plants.